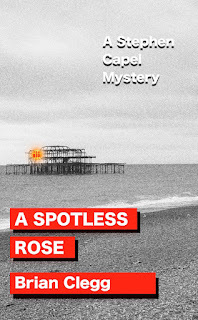 I am pleased to say that the third of my Stephen Capel murder mystery novels A Spotless Rose is now available as a paperback and on Kindle. In the sequel to A Lonely Height and A Timely Confession, vicar Stephen Capel is on his first holiday after joining his first parish in the village of Thornton Down. In Brighton with his girlfriend, Vicky Denning, Capel hopes to get away from it all. Taking a stroll on the beach, he sees a woman fall from the ruined pier. He rescues her, but discovers that she is dead - stabbed - and soon finds himself suspected of her murder. Each day, as Capel tries to untangle himself from suspicion, another woman dies. The race is on to prevent yet another death. It may seem that I've been coming out with these books rather quickly - it's because the first three were written a number of years ago. They came close to publication, but were considered rather too mild for the blood-and-guts preferences of the time. Now, I think, they make an excellent antidote to Scandi-Noir. There will be something of a pause before #4, though, as this is only partly written. If you do decide to go for a copy (available via my website either from Amazon, or as signed copies direct from me), please do leave a review on Amazon - even if it's just a line or two.